How many will learn how many lessons from the floods that devastated Kerala and Kodagu? The most important lesson is bound to go unlearned—that, ultimately, these were again examples of nature collapsing under the impact of human greed. We were warned of it five years ago when cloudbursts and landslides turned Uttarakhand upside down, killing nearly 6,000 people. It was adjudged a man-made disaster with hydroelectric dams, illegal mining and construction activities upsetting nature’s balance. The same greed-driven factors have been threatening most of the Western Ghats as Madhav Gadgil warned seven years ago. Land exploitation and illegal quarrying had reached dangerous levels. But the profiteers behind such exploitation always get support from government leaders and political parties. So, the Gadgil Report was subverted. Gadgil has pointed to the Kerala disaster and warned that Goa would be next. To see what he means, we only have to take a drive along certain areas of interior Goa that have been turned by mining companies into gaping holes in the earth. The miners and their political friends earned Rs 35,000 crore in profits, as an inquiry commission found. The story is the same whether it be Kerala, Goa or Kodagu, where entire plantations have disappeared in flood fury. Converting paddy fields and forest lands into resorts is an easy way to make money. When the natural movements of water are blocked and when hill slopes are cleared of vegetation, nature breaks into landslides, debris flows and rock falls. But we refuse to learn lessons as greed dances with corruption. The depredation that wrecked Kerala threw light on the best and the worst that make up our country. The way the local people rose to the occasion was both inspiring and humbling. Individuals and groups plunged into rescue operations disregarding all political and religious differences. Coastal fishing communities transported 700 boats by lorries to the affected areas and helped move 65,000 people to safe shelters. Social media groups set up online control rooms and call centres manned by hundreds of volunteers. Prisoners in the state’s jails prepared food in vast quantities in addition to contributing Rs 12 lakh from their prison-work wages. The authorities closed the gates of a dam to save a flood-trapped elephant. Four men risked their lives to save a dog that couldn’t swim against a strong current. The media did a great job combining responsibility with dedication. The chief minister showed timely leadership and instilled confidence in people while coordinating relief activities. He was even courteous to the media. What the world saw was a spontaneous people’s movement with the “We shall overcome” theme as a driving force. This groundswell of voluntary action by a people who refused to be cowed down by catastrophe added weight to the help that rushed in from outside. The armed forces, Central teams with special skills, and flood relief experts from Orissa were so brave that the locals took to them as family. The message was: This is a country that citizens can be proud of. But one sinister streak marred the whole scenario. Discordant notes came from the religious right and, astonishingly, from the Central government. A Swamy’s comment that Kerala was punished for eating beef may be dismissed as the ranting of a mental case. But what about a man from the BJP’s IT cell who uploaded an audio clip and text saying that the flood-affected people were mostly from well-to-do families who, therefore, deserved no assistance. He still asked for donations, but to a BJP-sponsored platform. There were others who said contributions should not be sent to the Chief Minister’s Relief Fund because the money could go to the minorities. The Central government’s partisan positions were the worst. What cacophony over the UAE’s supposed Rs 700-crore assistance offer. It forced the UAE to diplomatically unmention any figure, and it forced Delhi to say that its own Rs 600-crore offer was only for starters. At one point Delhi said that no foreign aid would be accepted, then it changed its semantics. It said rice supplied to the state would have to be paid for, then it said it would be free. The air got so filled with hatred that the misery of multitudes of people was forgotten. A BJP television personality in Kerala said in effect, his voice trembling with emotion, that all those who disagreed with him were idiots. None of this is the real issue. The real issue is that the Government of India has given the impression that it is inimical towards the government and people of a state. This is unprecedented and bodes ill for the future. Kerala floods have left many imprints for posterity. The neglect of ecology and the neglect of centre stood exposed . 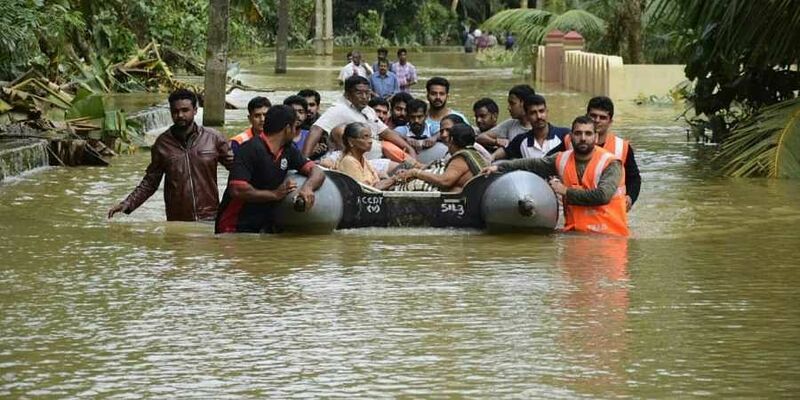 Keralites have shown their grit and unity in battling the damages. NDA's ugly bias towards Left rule is on display, be its piquine aid or be its discredited ban on foreign aid. The rare unity among Left and Congress displayed in crisis managemen is unique for the rest of the country to follow. The views of hindu fundamentalists against the victims viewed through the prism of religion are all time low. NDA's already sagging popularly in view of its bad administrative score, gets more eroded in view of the known apathy towards Kerala. I always respected TSGeorge and his columns. However, the 700 crores just played around by alleged phone calls was a sheer folly, by every reasoning. Will a CM not understand the scale of unfathomable money, and would not he ask for an official statement? This is not black money that they are talking about, instead of diplomatic assistance. "Diplomatically un mention any figure " is semantics. It would be more diplomatic ( as well as logic ) of UAE to officially announce it of their willingness to offer, if they were sincere in every sense. It is only now that they have lost their face and grace.